For Online Orders: For details on each item, click the image. To order click the “add to cart” icon. For Information on Mail Orders including our mailing address, scroll down to bottom of page. Orders by Bookstores: scroll down to bottom of page. All Prices for online purchases are quoted in US dollars. Payments through your credit card can be made in US$, Can$, Euro and British Pounds. Our payment system through Paypal accepts credit card transactions from 38 countries (Visa, Mastercard, Amex, Discovery). You do not need to register with Paypal to undertake an online purchase. Quoted prices do not include shipping and handling or customs charges where applicable. Sales taxes where applicable are included. The mail order prices and shipping (s & h) charges are the same as the online prices/ s & h. To order by mail send a cheque or money order made out to the Centre for Research on Globalization (CRG). See our mailing address at the foot of this page. If the shipping address is different from the billing address or you wish to send a book/video to a friend, kindly include a note to your order or contact us by email. All orders (Canada and US) are processed within two business days. Shipping in North America is by surface mail. Allow up to 2 weeks by surface mail. Orders outside North America can be shipped surface mail or airmail. In the case of an Overseas Airmail shipment, a surcharge of $10.00 is applied. For all Overseas Airmail orders (outside North America) Add US$10.00 on orders of US$50.00 or less, US$10.00 on orders over US$50.00 and under $100.00, pro rata thereafter. PLEASE NOTE: For orders which do not include the overseas airmail surcharge, shipment will be by surface mail. allow for up to 8 weeks. $10.00 for less than fifty dollars. Enter the surcharge twice if your order is over fifty dollars. Please Note: Overseas orders which do not include the Overseas Surcharge will be sent by surface mail. allow up to 8 weeks for delivery. The book will be mailed to you in November. If this purchase is combined with another item, the shipment of both items will be made upon the release of Seeds of Destruction. If you need the other item to be shipped immediately, we suggest you put in a separate order. In this updated and enlarged edition, Michel Chossudovsky blows away the smokescreen, put up by the mainstream media, that 9/11 was an “intelligence failure”. Through meticulous research, the author uncovers a military-intelligence ploy behind the September 11 attacks, and the cover-up and complicity of key members of the Bush Administration. Preface to the Second Edition, Background: behind September 11, Who is Osama bin Laden? Washington supports international terrorism, Cover-up or Complicity? War and the Hidden Agenda, The Trans-Afghan Pipeline, America’s War Machine, The American Empire, Disarming the New World Order, Political Deception: the Missing Link Behind 9/11. The pdf file will be sent directly to your email within two business days. Please note, this purchase cannot be combined with a pdf purchase of the Globalization of Poverty, which would to be placed in a separate order. . The pdf purchase above can be combined with other purchases, in which case the single item service charge is waived. Please note: the pdf file will be sent to the email address used in the Paypal transaction. For detail click image above. Michel Chossudovsky is Professor of Economics at the University of Ottawa. and Director of the Centre for Research on Globalization. Our price online US$18.00 including taxes where applicable. (Book list price of US$24.95, Can$34.95 plus taxes). 9/11 was the pretext to wage an illegal war agenda. Alarming facts are presented during the International Citizens’ Inquiry into the events of 9/11. You will learn how the official 9/11 Commission report was little more than a white wash! ‘“Celsius 9/11” asks the tough questions Michael Moore’s “Fahrenheit 9/11” does not dare delve into. The DVD is available to institutions, libraries for lending and public viewing at $85.00 plus s and h. Please send purchase order by fax or by mail to address indicated below. 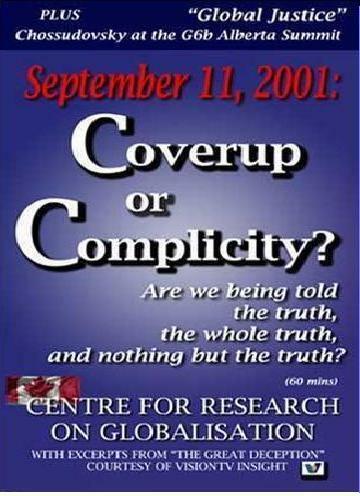 September 11, Coverup or Complicity? This carefully researched video sheds light on “what really happened” on 9/11. It unmasks the Bush Administration’s so-called “War on Terrorism” and situates the strategic interests of the Anglo-American oil giants in the Caspian Basin and the Middle East. The video reviews the origins of Osama bin Laden and how the Bush administration used Al Qaeda as a pretext not only to wage war in Central Asia and the Middle East but also to repeal the Rule of Law at home. The Video calls attention to the blind acceptance by the mainstream media of the official version of events. It suggests that we are on the lip of the gravest crisis of democracy since World War II. Designed to serve as a basis for anti-war activities and community discussion of alternatives and peaceful longer term solutions. Orders outside North America can be shipped Surface Mail or Airmail. For Air Mail orders add $10.00 on orders of $50.00 or less, $20.00 on orders over $50.00, Pro rata thereafter. Please Note: Overseas orders which do not include the Overseas Surcharge will be sent by surface mail. allow up to 8 weeks for delivery.